Article from The Hill by Jordain Carney. 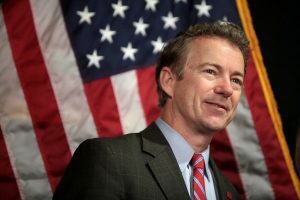 Sen. Rand Paul (R-Ky.) said on Monday that he will vote for the Senate GOP tax plan and urged his colleagues to “step up” and back the measure. “This tax bill is a true test for my colleagues. I’m not getting everything I want — far from it. … I’ve fought for and received major changes for the better — and I plan to vote for this bill as it stands right now,” Paul wrote in a Fox News op-ed. Thank you Senator Paul. I appreciate your efforts to get the best DEAL you could. Compromise use to be done across the political spectrum however since Obama divided the country so severely and Chuck Schumer seems hell bent on continuing that divide I am afraid we will NOT see any Democrats vote country over party anytime soon.